Artist, writer, illustrator, musician and dramatist. Nikl’s father was a painter and his mother was a doll designer. He studied at the secondary school of applied arts in Uherské Hradiště and at the Academy of Fine Arts in Prague. In 1995 he received the Jindřich Chalupecký Award, the most important Czech art prize for younger artists. He has also demonstrated his linguistic talents as a dramatist and a puppeteer. He thinks of himself as a ‘multidisciplinary clown’. The author glances at the surface, capturing hairstyles, parts of bodies, pieces of clothing, he allows himself to be enchanted by first impressions and special characteristics. Nikl’s wanderings through New York are reminiscent of N. V. Gogol’s walk along Nevsky Prospect in St Petersburg in his short story of the same name, where coats, dresses, hats and walking sticks are all on parade. If we leave aside the samizdat notes for the MEHEDAHA theatre group, which Nikl was involved in, and Vyhnání z ráje (Expulsion from Paradise, Divus, 1998), published in connection with the Open Museum Gates project, then Nikl’s first book was Pohádka o Rybitince (A Fairy Tale About a Wee Fish Named Rybitinka, Meander, 2001), which was published soon afterwards in English. There then followed the limited edition Atlas salta (Aulos, 2002) and the fairy tale O Rybabě a Mořské duši (Rybaba and the Sea Soul, Meander, 2002), which won the Ministry of Culture Award in the same year and was also successful in the Most Beautiful Book of the Year competition. Most of Nikl’s other books have gone on to be at least nominated for this award. Lingvistické pohádky (Linguistic Fairy Tales, Meander, 2006) was written at the start of the 1990s as a gift for his wife Pavla. Thanks to the publisher Iva Pecháčková, this original fine-art book was made accessible to readers. The book was awarded two IBBY Golden Ribbons, it came second in the Most Beautiful Book of 2006 and was placed on the IBBY international honorary list. The author characterized the collection of twenty-two one-page fairy stories, written in prose and verse, as “linguistic somersaults” and “little nonsenses”. The book begins by telling the story of the world’s largest giraffe, which, together with the animals slumbering on its neck, sleepwalks across the world until one morning it finds itself in Linguistica. The natives (linguists) invent linguistic fables about animals which become the linguistic fairy tales. 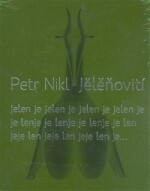 Jělěnovití (Deer, Meander, 2008), with its subtitle of Lesní lyrika (Forest Lyricism), not only presents the reader with forest creatures in pictures, but there is again some poetic text. One year later, Nikl’s Blázníček (Little Fool, Meander, 2009) was published, which leaves the world of animals and takes a fanciful look at the world of people. Critic Radim Kopáč described Přeshádky (Across Puzzles, Meander, 2010) thus: “Nikl has suddenly opened up metaphysical themes: he puzzles over myths, discusses the cosmic silence and follows what God has to say about it all. He is no longer in the safety of a fairy-tale dream world, but wanders across the endless, mysterious cosmos.” With the collection Žlutí lvi (Yellow Lions, Meander, 2011), Nikl returns to the very first book he wrote as a student in 1986, but only made a few copies. The story revolves around a mysterious dream about a lion. Divňáci z Ňjújorku (The Weirdos from New York, Meander, 2012) is more of a book for adults. After a two-year artistic residence in America, Nikl documented the human diversity he had witnessed by photographing the residents of New York and using those photographs to draw their portraits. Each was accompanied by a poem. As a tribute to his mother, who designed many of the toys for Fatra Napajedla, he published Foukací povídky (Inflatable Short Stories, Meander, 2013). In addition to the books mentioned, Nikl has also illustrated dozens of collections by other authors and has contributed to several of his exhibition catalogues.